You want your event to be perfect - from an exquisite ambiance to delicious cuisine and five-star service. Pavilion Grille does it all with panache. We make any occasion memorable, as well as affordable. Our event planners can customize menus and event packages to fit your budget. We can host your event on-site, or cater off-site at your home or office. Welcome to Pavilion Grille - Boca Raton's Premiere Dining, Dancing and Special Occasions Venue. 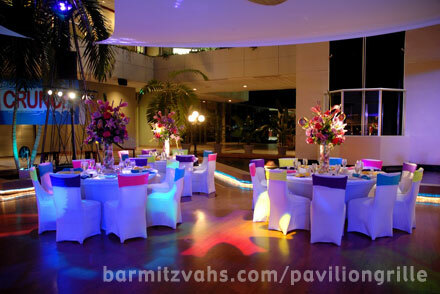 The spectacular Atrium area, ideal for Weddings, Bar/Bat Mitzvah's and Parties, features a Fountain, natural Palm Trees and Canopy-covered 2,000 ft. dance floor. Pavilion Grille's contemporary American menu selections focus on flavorful, fresh ingredients. Enjoy intimate 3-course dinners in the Grille Room or dine-and-dance light bites in the Atrium. Come early for 2-for-1 Happy Hour or dance the night away to popular local bands and DJs. Pavilion Grille is the perfect venue for all your family celebrations, Weddings, Rehearsal Dinners, Bar/Bat Mitzvah's, Birthdays, Graduations and Sweet 16s as well as Corporate Meetings and Events. Located in the Atrium of the Stonegate Bank Building.